Today I was thinking of some of my favorite summers ever. I loved the summer of 1982. I loved this song in the summer of 1982. It's new wave/synthpop UK group Human League's "Don't You Want Me". I knew all the lyrics and here it is 28 years later and I can still sing this song word-for-word. As a little girl, I remember listening to the song and thinking of it as a story and feeling sad and wondering which person was in the right. The former waitress or the boyfriend who helped turn her life around. Did I mention I was only NINE! Yes, at nine I was that into a song on the radio where I actually imagined the singers as real people singing about a real issue. Cute, right? Oh boy this takes me back. I have a picture of myself taken while working at Cadet Camp. The picture looks like it was taken in WWII because it's in black and white. I am wearing old style earphones and my uniform. The cassette I was listening to was this one by the Human League - Dare. I loved that group. Me and my friends and camp would wear dark eyeliner when we were off work because we were too cool like the Human League. The summer between grades 11 and 12 were the best and that album was the soundtrack for that time. Cool Post. I got burnt out on the song from every bloody commercial using it. My favorite Human League song though is (Keep Feeling) Fascination. Ooooooooh, that hair! I still love that song though. This a nice song. Though, I came across it recently. Love the simple music. I may not have been born when they were around but I still love them. I knew about 'Don't You Love Me' but after watching Ashes to Ashes I found that they had some other songs that were pure AWESOME. I was thinking it was really bad that I only recognised Chris DeBurgh (Lady in Red) from all the 'stars' making footprints (What the hell was all that about?) but realised at the end it was German. I know all the words to Ice Ice Baby. Yeah. Take that! It is an unforgettable song. That is cute that you were really feeling it. Back in the day, songs had more real life meaning like that. I remember Casey (on some countdown show-haha) revealed that HL only knew how to play keyboards for this single. But for their follow up hit "I'm only Human" they learned to play other instruments. A band that grows. Nice. FYI...I used to massacre the last part of the lyrics to this song all the time "...and I can teach you pac-man too!" one of my all time absolute favorite songs!! I like this song, but now sometimes I think about chocolate chip cookies when I hear it because of it being in that commercial. I like Human even more though. Oh yeah, I remember it well! I also remember that crazy hair! The dude in the middle...(it IS a dude, right? )....cracks me up with that hair! I totally did that stuff when I was nine. I was actually only 4 when that song came out though. But I do know all of the words. Must say that was a very odd video though. Wow the makeup they used to wear. So glad that phase is over. OH WAIT! it's back! :( Awesome. Hi Ally! I'm back from vacation and I've been poking my head up in everyone's blogs to say hi. My husband loved Human League. 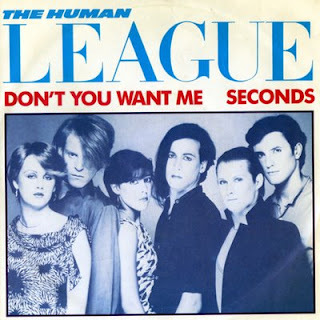 And yes, the song was sad and campy and all that other glorious stuff that Human League was so good at. Glad to be back here in Blog World! One of my favs! I could sing it word for word right now for you, but I won't. I actually heard this song at the club this weekend. Total throwback. I love this song! The '80s were a great time for music! I loved 80's avant-garde bands. And I loved British invasion punk bands of the era as well. This song means a lot to me - I was the same age you were when I first heard it. I made sense to my brain even then. Did you like Howard Jones?